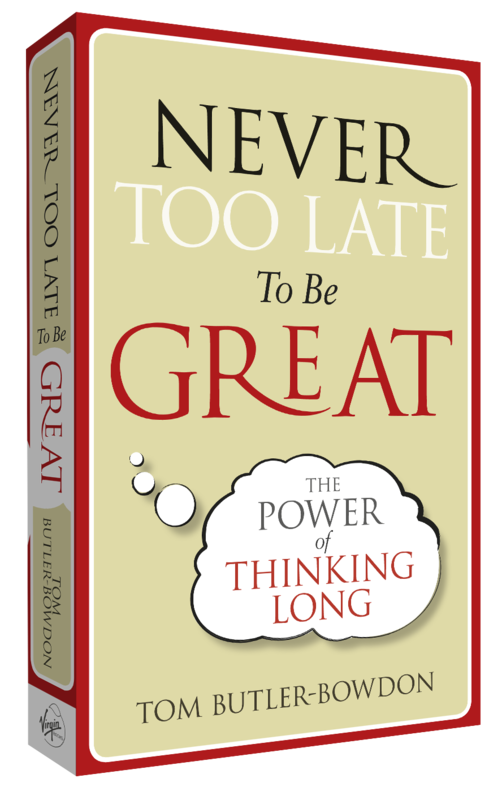 Tom Butler-Bowdon’s latest work Never Too Late to be Great will be out in March and I am sure it will be an excellent read. Tom Butler-Bowdon gave me permission to add his press release here for Never Too Late to be Great. It’s never too late to begin the journey of being or doing something remarkable. Never Too Late to be Great is about the power of thinking long. Exposing the myth of ‘overnight’ success, personal development authority Tom Butler-Bowdon shows us that contrary to popular belief, people, companies, products and ideas invariably need a long time to realise their potential. Highlighting the importance of the ‘ten-year rule’ as referred to in Malcolm Gladwell’s Outliers, which suggests that significant achievements rarely happen without a decade of intense work and practice in any given area, Never Too Late to be Great offers inspiration for the impatient or disheartened to stay the course, and gives reassurance to us all that, given the longer life spans most of us enjoy now, we have more time than we think to achieve our goals. 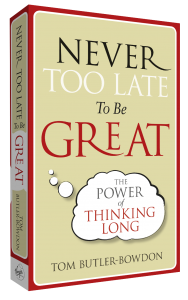 Written in the tradition of classic motivational literature, Never Too Late to be Great provides readers with the facts and inspiration necessary to help them banish the excuses that prevent them from achieving everything they want in life. It will appeal to adults at all stages, from people in their twenties, frustrated with the pace of their career progress, to people facing their mid-life or redundancy and looking for a change of career. Tom Butler-Bowdon is a graduate of the London School of Economics and the University of Sydney. He left his job as a political advisor to write the bestselling 50 Self-Help Classics – a guide to personal development literature. This was followed by other titles in the series: 50 Success Classics, 50 Spiritual Classics, 50 Psychology Classics and 50 Prosperity Classics. This successful series is now published in 22 languages. Tom has appeared on numerous television and radio shows in the UK, US and Australia.